NASA and Lockheed Martin completed the Flight Readiness Review (FRR) for Orion’s upcoming flight test Dec. 4, giving a “go” Thursday afternoon to proceed. The FRR is a rigorous assessment of the spacecraft, its systems, mission operations and support functions needed to successfully complete Orion’s first voyage to space. Meanwhile, farther west, the NASA, U.S. Navy and Lockheed Martin team that will recover Orion when it splashes down in the Pacific Ocean about 600 miles southwest of San Diego continues preparing the necessary equipment. 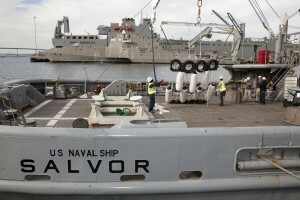 At Naval Base San Diego, two Navy ships, the USS Anchorage and the USNS Salvor, have been outfitted with the necessary tools and equipment needed to return Orion to land after the flight test. We’ll be watching from the Causeway! Go Delta! Go Orion!